To artificially create an arthritic-like knee in a perfectly healthy dog requires an awful instrument known as the dropping tower. This device drops a 2 kg weight onto the bent hind leg of an anaesthetised dog – most commonly a beagle, but Labradors, golden retrievers and German shepherd dogs are also used for this. The beagle in the photo is about to have more than 2000 N of force applied to her flexed knee. To put this in some context, a person bench pressing 100 lbs uses around 450 N of force. 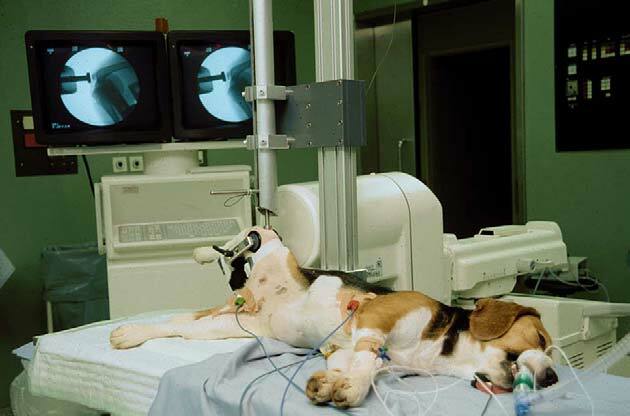 A beagle dog under the dropping tower that will be used to induce damage-related arthritis to her knee. She, like the other 11 dogs put through this procedure in just one study, will be brought out of anaesthetic and her pain monitored, but then she will be subject to open knee surgery six months later to allow samples of both of her knee joints to be harvested. In this case, the ethical committee that reviewed the study refused to permit her death so at least she was allowed to live after the experiments. Reprinted from Osteoarthritis and Cartilage, 14:2, Mrosek et al., Subchondral bone trauma causes cartilage matrix degeneration: an immunohistochemical analysis in a canine model, 171-178. Copyright (2006), with permission from Elsevier. Experiments such as these are often couched as “scientific advances,” yet if the point of this to create something that resembles the human osteoarthritic knee, I am not convinced. I doubt that any person with osteoarthritis has laid on a bed with their leg bent whilst a machine applies force to their joint. I am sure that I cannot be alone in wondering how this instant, traumatic event on a dog’s knee resembles the gradual, progressive change in the tissue that occurs due to an inflammatory response, in the way osteoarthritis develops in people. Osteoarthritis is an incredibly complex disease. It is the most common form of arthritis, affecting up to 15 percent of adults over 60 and is a major public health priority given the millions of working days lost to this condition every year. 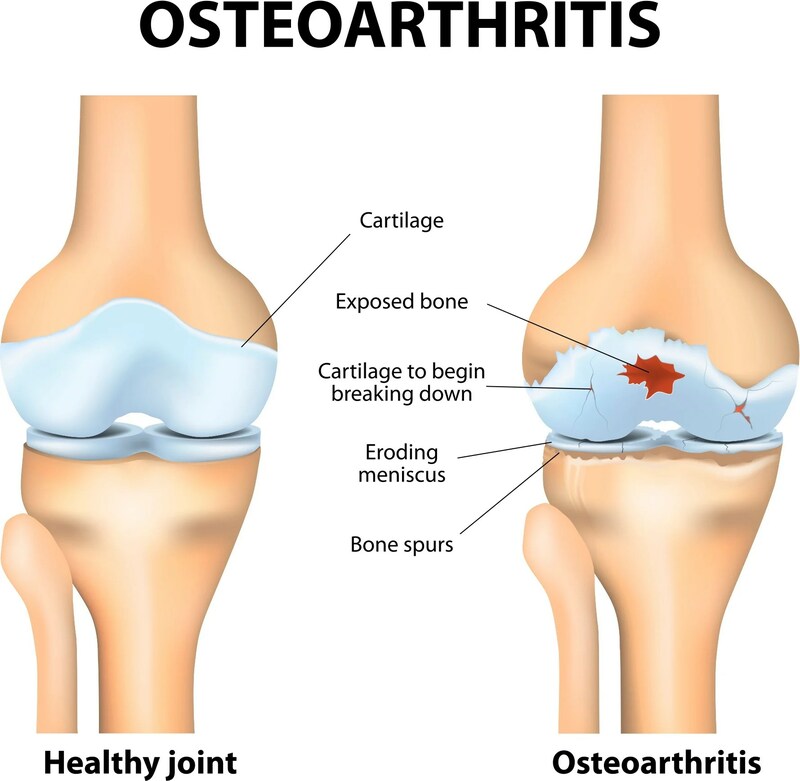 Osteoarthritis results in an ongoing inflammatory reaction that drives cartilage breakdown, reducing the joint’s shock absorbing capacity, and leads to obvious issues with mobility and pain. For people, there is currently no cure for the condition, and limited understanding of how it arises. So what can we do? We can stop dropping heavy weights on dogs’ knees for a start, because research using alternatives to animals is finding more solutions and offering additional hope. To address the issue of the chronic pain that people with the condition have to deal with, we can try and understand human pain better. Techniques such as neuroimaging, (looking at how and where the brain is involved in pain), microdialysis (sampling fluids from all over the body to see what is being released in the pain response) and even re-examining the possible analgesic effects of ‘failed’ drugs (i.e. those that have passed safety and toxicity testing but didn’t help a particular disease) are all options here. As with most conditions, better understanding of what is happening in people is the way to treat a human condition. For older people with osteoarthritis, a clinical trial looking at exercise found that chair yoga was more effective at reducing arthritis-related pain than general health education sessions talking about fitness and osteoarthritis. More recently, osteoarthritis has been described as a metabolic disorder. This is because in osteoarthritis, a switch in the metabolism of the cells that produce protective cartilage makes them release glucose, which activates inflammatory cells – stimulating them to wreak havoc in the joints. Deeper understanding of how this metabolic shift occurs is likely to give us an idea of how better to treat the inflammation, the underlying cause of osteoarthritis. In those poor damaged dogs, it is obvious when the ‘arthritis’ started (when the weight was smashed into their leg), but this is not the case for people with the condition – and for people, early detection could be key to reducing further joint damage and minimising their pain and discomfort. This may now be a possibility: a blood test has just been developed showing that the characteristic damage to proteins from early stage arthritic joints in people is distinguishable from non-arthritic samples. Computer algorithms can be used to predict how an individual’s disease might progress, and non-surgical management of osteoarthritis has been carefully evaluated as a short-term option. And finally, how about some seaweed with that? Alginate sulphate from the stems of brown algae has shown promising anti-inflammatory effects in laboratory cultures of the human cells implicated in osteoarthritic joint damage- this may lead to new biomaterials for joint repair. Considering these examples of human-relevant research – none of which relied on animals and all of which were published in the last few weeks – we can see how much great research for this condition is likely to happen in one year, and how much more could happen if we diverted funding away from studies of healthy young dogs being deliberately damaged and focus on more opportunities to apply 21st century science! Septic shock- replacing sick mouse ‘models’ with healthy human volunteers makes for better science. Stop it now. How can we claim dogs as family members and let this happen? Why haven’t they figured out that animals and humans are completely different!! Plenty of rapists n peidos in prison! Hi Lindsay, I totally agree that animals and humans are different, and that is partly why we see the huge numbers of drug failures when new medicines get to clinical trials for testing on people – the drugs that ‘worked’ on the animals are no good for people. Also, we have so many great new techniques that we don’t need to rely on animals and we’d like to see more focus on these new technologies. I don’t think that using prison inmates will help, or is necessary, given this exciting science happening in laboratories worldwide. Thanks for reading! This has to stop! Totally inhumane to these poor creatures. Why don’t they test on humans? Oh no, that would be unethical wouldn’t it? Well, it is unethical to commit these animals to torture, even if anaethasized. Is there any way this can be stopped? Looking for cures in all the wrong placed. They make me SICK. STOP THIS INSANITY NOW! I have severe osteoarthritis and I don’t want this to happen to help me EVER!!!! this is just soooooo inhumane ever!! totally unnessary in this current time when computers are doing 95 % of all testing for future meds and procedures whoever is doing this should be stopped NOW and our FDA should be on top of this!!!!! Stop this! karma isnt nice and theyare gods creatures too. Msty horrrible humans..
Stop this! So much cruelty to all animals! I’m sure there are other alternatives for this. Animals have rights to “we need to stand up and be their voice” STOP THIS NOW!!!! Please stop doing this and think about you are destroying something in order to thinking how to repair. Hurting animals doesn’t help humans. Those who do so are damaged themselves. Unfuckingbelievable! Stop torturing dogs for the sake of a lousy simulation. Inhumane and should be illegal. Stop it..stop it stop it😡 yhere are plenty of people in prisons you can use. Stop this barbaric practice for the love God what is wrong with you asshats. We are in a time now that animals arenot needed for your evil experiments. Enough already. Hi Tammy, thanks for your comments, you are so right that, now we are in the 21st century, we should not still be relying on animals for testing like this. However, we don’t need to use prisoners either! That is not as ethical as some of the new, exciting advances that are happening in research, and we strongly support these non-animal technologies in place of dogs. Please do not experiment on dogs or any other precious animal. They are not yours to abuse!! Animals have every right to be free & loved. There is no need to use animals in your trials – artifical means is very effective!! Dear Cynthia, thank you so much for reading and commenting. I am really sorry to hear about your pain issues and thank you again for understanding that these experiments on dogs are not the best way to help you. It is so important to me that people who are experiencing the sorts of pain and discomfort that you are, are still against this distressing animal testing. As you say, there are many alternatives to animals that are way more relevant for people! Take care, Lindsay. I have osteoarthritis along with Spondylolisthesis.I have tried every med and therapy, but still in constant pain…never below a 6! However, if torturing animals is the only way to find something to reduce my pain or potentially”cure” me, I’ll choose to live with the pain! With the advances in science, animal testing is completely unnecessary and cruel! Dear Dana, thank you so much for reading and commenting. I am really sorry to hear about your OA and spondylolisthesis and would like to thank you again for understanding that these experiments on dogs are not the best way to help you. It is so important to me that people who are experiencing the sorts of pain and discomfort that you are, are still against this distressing animal testing. There are many alternatives to animals that are way more relevant for people! Take care, Lindsay. I have a bad knee and I am trying various routes to help with the pain to avoid surgery. No matter what pain I have, I would NEVER, EVER want an animal to go through this barbaric torture. STOP animal testing now! STOP THIS INSANITY NOW! Dear Nancy, thank you so much for reading and commenting. I am really sorry to hear about your pain. It is so important to me that people who are experiencing the sorts of pain and discomfort that you do, are still against this distressing animal testing. There are many alternatives to animals that are way more relevant for people! Take care, Lindsay.